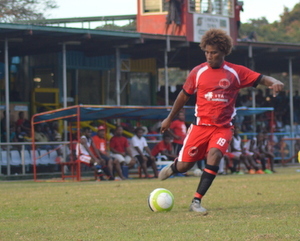 The only surprise emanating from the match up was the number of goals not scored as expectations were for Solomon Warriors to annihilate West Honiara. However, the 3-nil score line summed up a more balanced match with Solomon Warriors earning maximum points thanks to the quality of its line up. The opening thirty minutes of the match went by goalless as Solomon Warriors started scrappily and allowed West Honiara some momentary bliss inside their penalty box. Soon enough their engines warmed up and quickly, West Honiara were back pedalling in their own half. Interestingly, it was Solomon Warriors’ little know midfielder, Lency Norman who put them in front with a neat finish from inside the box. A few minutes Norman almost made it two nil but his effort, taken from a good position, sailed way above the cross bar and Solomon Warriors cruised to the break with just a slender lead. The second half saw some tactical changes introduced by Toata which injected life into the Solomon Warriors attack. The changes paid off when defender, Brian Kaltack score his third of the season to make it 2 to nothing as the match turned towards its final lap. With six minutes left on the clock Solomon Warriors went 3 nil up thanks to another defender, Bata Furai who volleyed home an uncleared cross. While it may not be the score line one expected from this match, Solomon Warriors proved that when its top finishers are in the doldrums, they can still call on their defenders to get the job done. Solomon Warriors will play Western United in the coming round in what is already touted as the match of the league. West Honiara, who are bye in the next round, will take the weekend off for a much needed break.